The exterior of the Aquarium of the Pacific's whale-inspired expansion is complete. Courtesy of the Aquarium of the Pacific. Construction on the exterior of the Aquarium of the Pacific’s massive $53-million expansion, dubbed the Pacific Visions wing, was finished Wednesday after the final panel was placed on the outside of its blue whale-inspired design. The 29,000-square-foot, two-story, project was unveiled over two years ago after San Francisco-based firm EHDD revealed its design for the Aquarium’s first expansion since opening in 1998. 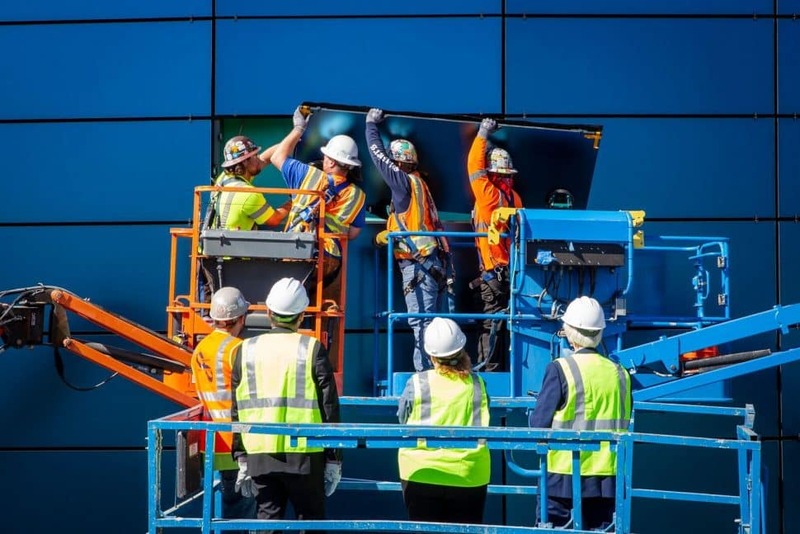 Crews install the last piece of glass on the exterior of the Aquarium of the Pacific’s $53-million expansion. Photo courtesy Aquarium of the Pacific. Originally slated to open this year, the project has been pushed back to an opening date of spring 2019, when visitors will finally be able to experience the highlight of the project, the Honda Pacific Visions Theater. Viewers will be submerged into a virtual ocean environment thanks to a massive, 180-degree curved screen that measures some 130-foot-wide by 32-foot-tall screen. At the floor, a 30-foot-diameter projection disc will help “move” the audience in and through simulated aquatic scenery. That scenery will be courtesy of the work currently being headed by Cortina productions, which specializes in immersive, 4-D film and theater experiences at venues across the nation. Highlights have included the “Festival Experience” at The Museum at Bethel Wood dedicated to the history of the famed Woodstock festival, as well as the award-winning “Blue Planet Theater” at the Gwinnett County Environmental & Heritage Center in Atlanta. In addition to the theater, the expansion will also include—of course—fish and other animals for visitors to view thanks to 6,000-square-feet of new exhibition space. Editor’s note: This article was updated on Oct. 18. It was originally published on Sept. 11, 2018.